He’s one of only two men who’ve successfully re-enacted Shackleton’s heroic voyage from Elephant Island to South Georgia, and now Plymouth Royal Marine Baz Gray has set himself a gruelling new solo challenge that’s much closer to home. Baz, the Regimental Sergeant Major at 30 Commando IX Gp RM in Stonehouse, aims to break the record for completing the 630-mile Solo South West Coast Path by crossing the finish line in under 10 days – and you can play a part in the attempt by joining Baz on the route. The existing record is 11 days and eight hours. 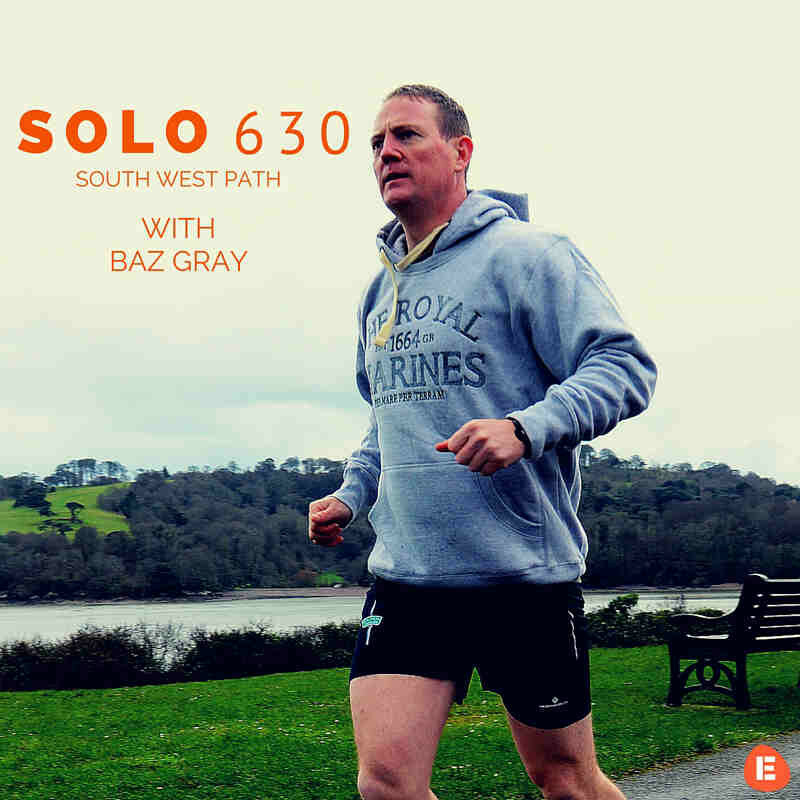 The challenge – Solo 630 – is raising money for Royal Marines charities and increasing awareness about the armed forces charity The Baton, of which Baz is a trustee, and the charity that maintains the route, the South West Coast Path Association. As well as his 10-day completion target, Baz has also set a fundraising target of £10,000 and a target of 1,000 members of the public to join him as he jogs and walks the route along the north coast of Somerset, Devon and Cornwall and then the south coast of Cornwall, Devon and Dorset. Baz is currently in training for Solo 630, which gets under way in Minehead at 10am on Monday 25 April 2016. He hopes to reach the end of the coast path in Poole, Dorset, some time before 10am on Thursday 5 May. It will be the last of Baz’s fundraising endurance challenges, as he leaves the Royal Marines later this year after 26 years. Baz, who has had tours of duty in Iraq, Afghanistan, Kosovo and Northern Ireland, says the support is needed now more than ever before: “The Royal Marines have been hit really hard in the past 10-15 years,” he said. “I’ve lost a lot of friends and a lot of friends will need assistance for the rest of their lives. Previously Baz has raised money through a 24-hour non-stop skiing marathon in -30 temperatures, a roller-ski from John O’Groats to Land’s End, and a 176-mile 48-hour non-stop trek on the coast path between Poole and Lympstone and back. But easily the most arduous adventure he’s ever undertaken was the Shackleton Epic over 20 days in January and February 2013. The six-man team battled through 30ft waves in a replica of the wooden lifeboat, James Caird, to get from Elephant Island to Peggotty Bluff on South Georgia. The expedition was an authentic re-enactment of Shackleton’s life-saving journey for help after his Imperial Trans-Antarctic Expedition went disastrously wrong when their ship, Endurance, became trapped and crushed by pack ice. As near as possible, the Shackleton Epic used the same equipment and methods as the original journey to find help. Shackleton had taken five men with him in James Caird, leaving 22 to await their rescue on Elephant Island. On reaching Peggotty Bluff, three men stayed behind while Shackleton and two men crossed the snow-covered mountains and treacherous glaciers to finally find help at the whaling station in Stromness. Ultimately all the men were rescued. By the time Baz and his five colleagues reached South Georgia in the re-enactment, only he and expedition leader Tim Jarvis were fit enough to carry on with the help of a member of the support team. Baz’s role was as mountain leader and he followed in Shackleton’s footsteps to get them safely to Stromness despite driving winds of 100mph. So after that, does Baz think that completing the South West Coast Path will be like a walk in the park? “We could have lost our lives at any stage during the Shackleton Epic which was a mental endurance as well as a physical one. “I won’t be encountering life endangering conditions in Solo 630 but it has its own challenges – for example, with all the inclines I’ll be climbing the equivalent of four times the height of Everest. And the terrain is challenging so that sustaining an injury is a risk. One ankle twist could jeopardise the whole thing. So it will be a very tough 10 days, averaging 63 miles a day. “I’m preparing well. I’m running every day, with one long run each weekend. I’ll increase that long run between now and the start, with a maximum of 40 miles in a day in my training. Once the challenge starts, I’ll need to take care of my nutrition, strength and my pace. Baz will have a support team during the challenge – and he’s hoping that YOU can be part of that too, by offering accommodation at each night stop and by joining him on the route. Route and stopover details are on the Solo 630 Facebook page. Baz explained why he’s so keen for people to take part: “Part of this challenge is to raise awareness about the coast path and the work of the South West Coast Path Association. They do great work, maintaining and improving the coast path so we can enjoy it. “But how many people have never even walked a stretch of it? It’s here on our doorstep so let’s get out there and see it, take in the fresh air and get active. The South West Coast Path is the UK’s longest national trail. It boasts two World Heritage Sites, a National Park, five Areas of Outstanding Natural Beauty, a UNIESCO designated Biosphere Reserve and a Geopark. The Royal Marines shop is providing the kit with the challenge logo – including Solo 630 T-shirts which people joining Baz on the route can buy from the support team. They’re also available online, with all the proceeds going to Royal Marines charities. “I really want this to gather momentum before I start,” said Baz. “I’ll be out training with my kitbag on my back with the flags sticking out the top. So if you see me, give me a wave!